Heat oven to 350°F. Grease bottom only of 13x9-inch pan. In large bowl, combine brownie mix, water, oil and eggs; beat 50 strokes with spoon. Add 1 1/2 cups pecans, the chocolate chips and 1 cup of the vanilla chips; mix well. Spread in greased pan. Bake at 350°F. for 28 to 34 minutes or until center is set. Remove from oven; immediately sprinkle with remaining 1 cup vanilla chips. Return to oven for 1 minute to soften chips; spread evenly over brownies with back of spoon. Cool. In small bowl, combine all frosting ingredients except pecan halves; beat until smooth. (Mixture will be thin.) Spoon over melted white vanilla chips; spread to cover. 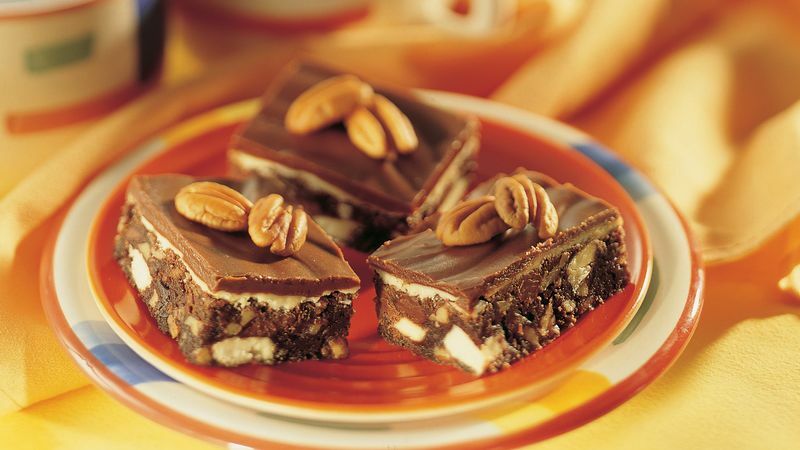 Arrange pecan halves over frosting. Cool 1 1/2 hours or until completely cooled. Cut into bars.